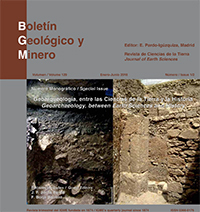 The role played by geologists and mining engineers in the consolidation of prehistoric archeology in Spain (1860-1970). On the potential of the Electron Spin Resonance (ESR) dating method in geoarchaeological contexts: an overview of 30 years of investigation in the Iberian Peninsula. Pleistocene geodynamic evolution of the Arlanzón valley: implications for the formation of the endokarst system and the open air archaeological sites of the Sierra de Atapuerca (Burgos, España). The caves of Sierra de Atapuerca and human use of the karst landscape during the Pleistocene (Burgos, Spain). Geoarchaeological study of the Sidrón cave (Piloña, Asturias). The geoarchaelogical research on the Late Pleistocene Mousterian occupation deposits of the Abric Romaní rock shelter (Capellades Barcelona, Spain). Geoarchaeological analysis of Mousterian settlements in the upper part of the Eresma river valley: Abrigo del Molino (Segovia, Spain). Towards a revised stratigraphy for the Middle to Upper Palaeolithic boundary at La Güelga (Narciandi, Asturias, Spain). Soil micromorphology and new radiocarbon data. Geoarchaeological and Chronostratigraphic study of the Upper Pleistocene record of the Cierro cave (Fresno, Ribadesella, Asturias, Spain). Depositional and anthropic processes in the Holocene record of the Can Sadurní cave (Begues, Barcelona, Spain): microstratigraphic contributions. Geoarchaeology applied to paleo-environmental reconstruction: Late Holocene evolution in NE Spain. Fluvial dynamics during the Early Upper Holocene in the Vinalopó middle watercourse (Alicante, Spain). Geomorphology and environmental change around the Punic sites of the Terralba plain (Oristano Gulf, Sardinia, Italy). Evidence of Quarrying at the Iron Age Site of Torre d’en Galmés, Menorca, Spain. Evolution of the lower Guadalquivir river floodplain during the middle-late Holocene. Geoarchaeology and palaeogeographic reconstruction of the Italica Roman site (SW Spain). Historical mapping and geoarchaeological reconstruction of the Roman city of Caesaraugusta (Zaragoza, Spain). Las Hoyas in the “dehesa” of Cañal (Salamanca, Spain), an ancient sedimentary gold mining excavation. Seismic effects in archaeological sites: archaeoseismological cataloguing and quantification.